It didn’t take me long to finish the novel. The story is about 5 year old, Jack who lives with his Ma in a room ever since his birth. From the bird’s eye view, Room is where they are held captive for the last 7 years by Old Nick ever since she was abducted by him when she was 19 years old. Caution: for all those who are familiar with my style of book reviews would know that spoiler-free is the way to be (Ha! Rhyme!). In this particular review, I’m afraid it will be hard to refrain (another rhyme!) from getting into the story in detail. You see, the plot is such that a discussion post-reading is quite impossible. It’s a very strange case to us but when you look at it from a 5 year old’s point of view, it makes complete sense. Back to the story; Right, so after being held captive in a Room, a small shed in the backyard equipped with minimal facilities for their basic survival, Old Nick sexually abuses Ma regularly to the point where she got pregnant. Her one successful pregnancy is when she gave birth Jack and the only thing that she could offer to this child was herself in a Room that is the only world he would ever experience. So she thought. Ma does everything in her power to protect Jack from Old Nick and has made him sleep in the wardrobe everyday. The only way she could shield him from Old Nick. Little does she know, that Jack has been counting the ‘creaks of the bed’ every single night. Heartbreaking to know that a child who knows no meaning of the occurrence is forced to endure that. Cut to the chase, Ma and Jack device an escape plan that works perfectly and takes them to safety. This where everything goes topsy turvy. Jack is born and raised in a Room with no experience of the real world. To him ‘Outside’ is almost as alien as a new planet is to a layman. So when Jack is taken to a safe facility with his mother where he meets new people, gets to eat as much as he likes and just be a child, it frightens him. His mother is grasping hungrily at the freedom that she could once only dream of and the fear of losing her is a constant worry for little Jack. Even though they do find an escape and are trying to have a better life, it’s extremely difficult for Ma, Jack and the family around them. The understanding of the real world and it’s functioning only makes Jack more withdrawn from people. Information overload for a child that lived all his life in a room which was his only world and for it to be snatched away seems cruel to him but absurd to us outsiders. Ma gets no better either. After enduring that ordeal in such a young age and her family considering her dead for all those years, her mental healthy begins to swing. Now look at it this way, life doesn’t really get better for the two even after they leave the Room and that’s what hurts us readers the most. We pray so hard that they escape and get the happily ever after they deserve but things gets more complicated than that. Life outside has moved on while they lived in a box and the changes aren’t all a warm welcome. That’s the real tragedy in this book. Even after the torture and confinement, Ma and Jack go back once again to visit Room before it gets demolished just for memories sake. Emma Donoghue is a genius for nailing every nook, every corner, every detail, every dust bunny, every piece of dirt, furniture, cloth, toy and much more in this book. What I was not a big fan of, was the narration. The entire book is written from 5 year old Jack’s perspective which I felt was not well formulated. Five year olds don’t talk that way nor can they make complete sense of body functions in the way the book describes it – The biggest flaw in the book. It’s not just me who noticed this but other Goodreads Reviewers have expressed their concerns over the same. That’s the risk Emma Donoghue tookas mentioned earlier. This ‘voice’ that it was narrated in, also made the story a bit sleepy in certain areas. Not uninteresting but ‘lets fast-forward a bit’ kind of slow. 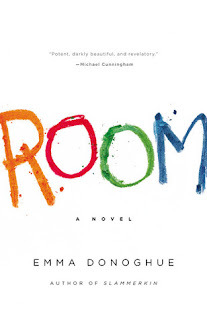 In terms of recommendations, I wouldn’t suggest this to everyone since this is more of a book that presents a fictional case study instead of a leisurely read and knowing the fact that ‘Room’, is by no means, a happy book. If you have the courage to read more about child abuse or the possible threats that could be surrounding the young minds, then you can definitely put this in your TBR list somewhere.